Today’s 31 Days of Free Writes word is JOY. Joy is something that I didn’t always have. Sometimes I’m super jealous of little kids. They have SO MUCH JOY over the silliest things. I dropped my cup! They laugh their heads off! Their hair is sticking up after taking a nap? No big deal that is joyful as well. Joy is really hard to understand and describe. You either have it or you don’t. I think at times people who have faced tragedy sometimes have a hard time finding joy in life. I know that was the case for me. In the years after my dad passed away I didn’t find joy in a lot of things. As the years went by the holidays got harder and harder. As people I knew started getting married weddings were harder and harder to attend and plan. Even planning my sisters wedding was hard for us at times. We wanted to be joyful but at the same time we weren’t. Losing someone and dealing with tragedy is really hard to process. I think for every joyful occasion we experience there are a few sad memories that also come up. I think joy and sadness are just a part of life and the way we process the two together is how we deal with life in a healthy way. Not to be all debbie downer in this post but I had a very joyful childhood. Even though my dad passed away when I was little my childhood was full of family, cousins, wonderful vacations, and tons of memories that we still talk about to this day. This is Day 23 of my 31 Days of Free Writes Challenge. Go check out my landing page for more words. Life is often a joy-stealer but God is the Joy-Giver! Praying that you find more joy and less hurt! A really good honest post. We started at the same place in our writes – that joy wasn’t something we always had in our lives. A common experience. 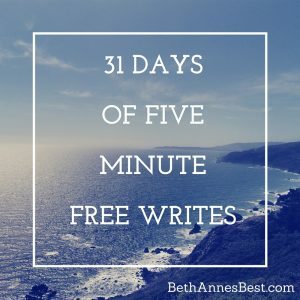 Well done on doing the 31days of free writes! !